Using up leftover BBQ Beef Brisket generally isn’t a problem. Still, a brisket yields a lot more meat than most of us can eat at one meal. You could make a sandwich (or two) the next day, of course. But how about trying something different? When the weather is cold (as it currently is throughout most of the US), nothing warms you up better than a bowl of chili. So why not use your leftover barbecue brisket to make chili—complete with sauce. It’s like barbecue in a bowl. And speaking of bowls, if you haven’t already planned the menu for your Super Bowl festivities, this would be a great dish to serve. You can easily prepare it ahead of time and then reheat it on game day. Plus, it’s a dish that will be new to many of your guests. And since both teams in this year’s Super Bowl have been there before, it’s nice to see at least something new, right? This dish marries the smoky tang of barbecue with the spice of chili. It’s delicious when made with your own leftover Oven Slow-Cooked BBQ Beef Brisket, but you can use any barbecue beef brisket in this dish. So if you don’t have leftovers on hand, maybe a visit to your favorite barbecue joint is in order. We also like to use about half a batch of our Green Chile Chili Beans in this dish—they add a lot of zip. But you can substitute canned pinto beans instead if you wish. Kidney beans work too (they’re often found in chili recipes). But for this particular dish, we think pinto beans work better. Prep time for this dish is 15 to 20 minutes. Cooking time adds another 45 minutes, maybe a bit more. The dish improves in flavor if you make it a day or two ahead. Just refrigerate the chili in an airtight container, then reheat it when you’re ready to serve. This recipe serves a crowd. Leftovers freeze well. Cut the beef brisket into dice of ½ inch or so. Set aside. Peel the onions and cut into dice of ½ inch (or a bit smaller). Set aside. Peel the garlic and mince finely or cut into thin slices. Set aside. Wash the jalapeño peppers (if using), cut off their stems, then cut each pepper lengthwise. Using a teaspoon or soup spoon, scoop out the seeds (the oil from the seeds will be hot; keep fingers away from your eyes). Mince the jalapeño peppers finely or whirl them in a mini food processor (reserving a slice or two of pepper for garnish, if you wish). Place the minced peppers in a bowl until you’re ready to use them, then wash your hands with soap and water to remove the hot jalapeño oil from your skin. In a large Dutch oven or cooking pot (6 quarts is a good size), heat the olive oil on a medium stovetop. When hot (the oil will shimmer), add the diced onions. Season with salt and pepper, then sauté until the onions are translucent, but not yet brown (5 to 8 minutes). Once the onions are translucent, add the minced garlic and jalapeño peppers, then sauté for a minute or two. Add the diced brisket, chile powder(s), cumin, coriander, and oregano. Stir to incorporate, then add the diced tomatoes, barbecue sauce, beer, and beans. Stir, then add a bit of water (or beef broth) if needed to get the chili to the consistency you want. Bring the mixture to a simmer. Once the chili comes to a simmer, set a timer for 15 minutes. When timer goes off, taste the chili and add more seasonings if necessary. We suggest adding brown sugar at this point—we think the sweetness adds depth of flavor to the chili. But taste first, and decide whether you want to use it. Continue to simmer the chili for another 30 minutes (or a bit longer if you wish). After the simmering is complete, you can serve the chili or refrigerate it for later. When ready to serve, see Notes for garnishing suggestions. A refresher on terminology: A “chile” (with an e) is a pepper; the plural is chilies. When you dry chile peppers and grind them up, you produce chile powder. Chile powder contains nothing but chilies. By contrast, chili (with an i) powder is a mixture of herbs and spices that includes chile powder as one of its ingredients. You can use either chile or chili powder to flavor the dish called “chili.” Totally clear, eh? If you’re using chile powder for this recipe, we suggest using one that’s mild to medium in terms of heat level. Ancho chile powder is fairly mild, has good flavor, and these days can be found in most grocery stores. Dried Hatch chile powder has wonderful flavor and is worth seeking out. Chipotle chile powder is fairly spicy—we suggest adding a bit because its flavor is wonderful. You can also substitute chili powder for chile powder(s) in this recipe. As noted above, however, chili powder contains seasonings in addition to dried powdered chilies. If you go this route, use 3 (or more) tablespoons of chili powder. Reduce the cumin, coriander, and oregano by about half, or eliminate them altogether (since these flavors generally are incorporated into chili powder). The taste of the finished dish won’t be as crisp if you use chili powder, but you’ll still be pleased with it. We think this dish works better with a fairly spicy barbecue sauce (like our Tangy Barbecue Sauce). But use whatever sauce you like. And feel free to tinker with the quantity—a bit more works nicely in this dish. Which beer to use? We prefer something with a bit of character, such as a sturdy ale. A stout or porter might add too much heft, while a light-bodied lager might add too little. But the choice here is yours. If you don’t want to use beer, substitute beef broth (or water, although the flavor of the dish will be a bit thin in that case). Or use a combo of beef broth and more barbecue sauce. We think adding some brown sugar (Step 8) bumps up the flavor of this chili. Don’t use too much, though—you want just a hint of sweetness. Kosher salt is more coarse than regular table salt, so it’s less salty by volume. If you’re substituting table salt for Kosher, always use less—about half as much. If the dish isn’t salty enough, you can always add more later. There are many garnishes for chili that not only look great, but add a flavor boost. A slice or two of jalapeño pepper, a handful of oyster crackers, some grated cheddar cheese, a sprinkle of diced raw onion, or a dollop of sour cream or plain yogurt all work well. “That whole thing is a balls-up,” I sighed, shaking my head. “So what does the crystal ball say about the big game on Sunday?” asked Mrs K R.
Mrs K R sure knows how to get herself behind the eight ball. This is a great use for the leftover brisket but in my house of carnivores, brisket and the like are eaten up very quickly! I do like the whole bbq and chilli thing though, never thought about combining the two. My kids put bbq sauce on everything, I bet they'll love this chili. Thanks for the idea,John! As for the SB, you know my feelings... As a devoted Bronco fan, neither of these teams does it for me. I'll be in the kitchen cooking it up. Hi Shibi, there are so many different ways to make chili! And it's great with BBQ flavors. ;-) Thanks for the comment. Hi Nazneen, it sounds a bit odd, but BBQ chili really works. Good stuff! Thanks for the comment. I need to try a chili soon! This look divine! This looks so lovely and I've tried your bean... they are amazing.. loved every spoon of it. Seems that I'll try this soon.. 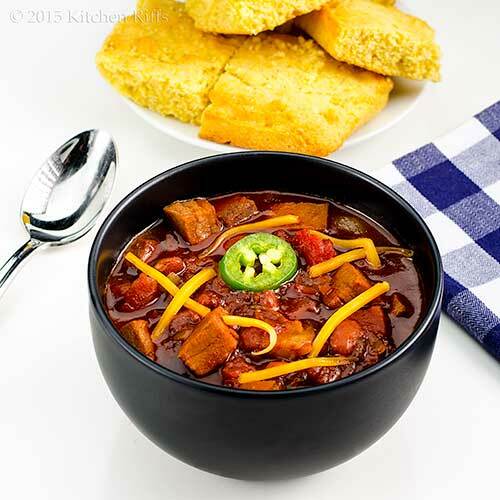 This bowl of tasty bbq beef brisket chili accompanied by cornbread is the perfect meal! Interesting reading all the super bowl recipes from an Australian's perspective. It sure is a big thing, isn't it! A fab chilli recipe, looks so rich and tender. John, thanks for sharing. I love chili and brisket and now you have me intrigued by combining the two and adding bbq sauce. This is so creative. I can't wait to try it. Hi Kiran, I love chili at this time of the year. OK, any time, but it's particularly nice in cold weather. ;-) Thanks for the comment. Hi Sue, it's pretty hard to beat leftover brisket, but this dish sure elevates it! Thanks for the comment. Hi Amira, isn't that bean dish good? I used some of it in this chili -- it works really well. :-) Thanks for the comment. Hi Pat, BBQ chili deserves to be more popular! It's really good stuff. ;-) Thanks for the comment. Hi Rocquie, it's fun having dishes do double duty, isn't it? Thanks for the comment. Hi Nee, Mrs K R is indeed a cutie, isn't she? ;-) And this is a great use for leftover brisket! Thanks for the comment. Hi Denise, we really like this dish! Definitely chili, and definitely BBQ -- just a fun flavor combo! Thanks for the comment. Hi Lizzy, the Super Bowl is really a big food event here -- even for people who don't care that much for the game. Loads of people looking for fun recipes at this time of the year -- it rivals Christmas! Thanks for the comment. Hi Karen, isn't this a fun combo of flavors? And it's really worth trying -- I think you'll enjoy it. Thanks for the comment. Hi Maureen, this is dynamite stuff! You'd like it. :-) Thanks for the comment. oh wow! 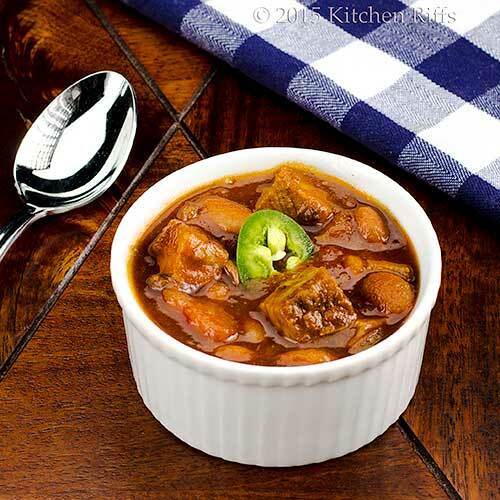 I love this BBQ Beef Brisket Chili ! That's the kind of meal I totally adore! Spicy and with plenty of delicious flavors! Amazing recipe! OMG! I was thinking of making Chili Soup today and here you are with a wonderful bowl of chili! I bet this has all those smoky flavors since it's made of beef brisket. 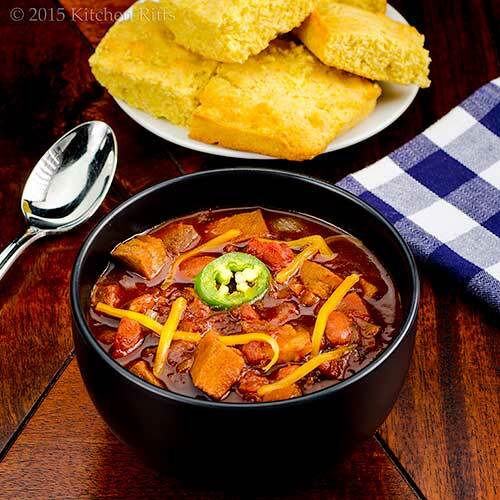 What a wonderful idea to use leftover BBQ brisket into chili, John! My Superbowl loving husband would love to have the chili as he watch the game this Sunday. In aniticipation of this delicious post, John, I finally found myself the perfect size beef brisket! Thanks to your suggestion, my neighborhood butcher was more than willing to get me the right size. I'm sure this "wild" weekend had something to do with it. I'll be making that brisket on Saturday!!! I love the notion of a brisket chili. The flavors are most certainly there. I don't usually have beer in the house but I have substituted leftover coffee in chili recipes before so if need be, I think I would go with that for the double duty dish. Thank you so much for sharing all of this informatin, John. I often need a primer when it comes to all this chili stuff!!! Enjoy the game!!! Wow! 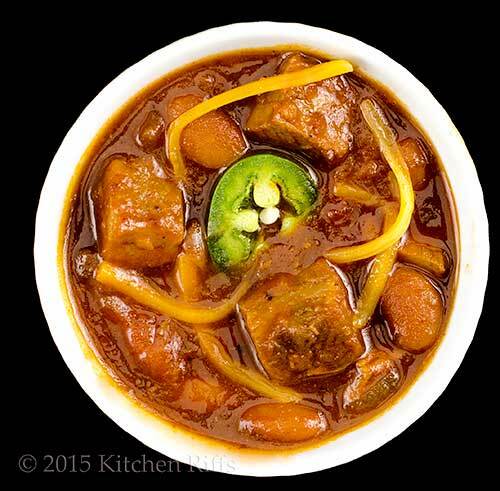 What a fantastic dish of BBQ Beef Brisket Chile. A good way to use up leftovers. I love Chili and this is a great recipe. Have to try this one...I also like the ingredients, they all are a great combo! Plus the cornbread adds to this warm and cozy bowl of Chile.Great for the Superbowl too.... Thank you for sharing...Have a great time watching the Superbowl! We always eat leftover brisket as is---maybe that is why I only make it about once a year! I love the idea of using it in chili! Kicking it up a notch, for sure!!! HI Marcela, spicy is good, isn't it? And this dish sure does deliver flavor! Thanks for the comment. Hi Peachy, glad to help out. ;-) This is such a terrific dish! Thanks for the comment. Hi Holly, your husband would love this. You, too. ;-) Thanks for the comment. Hi Louise, coffee is a really good substitute for beer in this, I'd think. I haven't tried it in this particular recipe, but I have in others, and liked it. Enjoy your brisket! Twice. ;-) Thanks for the comment. HI Dottie, cornbread goes well with so many things, doesn't it? We don't make enough of it. Or this chili. ;-) Thanks for the comment. Hi Liz, we usually eat leftover brisket as is, too. Which is nice and all, but sometimes one wants a change. And this is a real change! ;-) Thanks for the comment. I remember when my dad used to make stews like this!!! So good! Melts in your mouth! You be the MAN! I love using everything in my fridge and this is one way to get it all cleaned out at once! Perfect John! This chili has balls! Hi GiGi, this is good stuff! And a bowl of it disappears in a hurry. :-) Thanks for the comment. Hi Charlie, this is a fun recipe, isn't it? Whole new ball of wax. ;-) Thanks for the comment. Hi Abbe, this is kind of a clean-out-the-fridge recipe, isn't it? Which is OK in my book. ;-) Thanks for the comment. Love the idea of mixing up chili by using brisket! I'm not a huge meat-eater, but mr. table definitely is, and he loves both brisket and chili. And the flavors you have going on in here are really nice: i like how you layer the spices with the bbq sauce and with the beans: complex flavor always seems to make the best chili. I love both of these brisket recipes you've posted. Can you believe that I've never cooked a beef brisket, except for corned when I'm feeling green. That's about to change. Doing a crock pot beef brisket for tacos on Sunday. Yay for Superbowl food. What a wonderful idea John. Love the idea of two totally different meals out of one brisket. What a fabulous leftover chili! Combining leftovers always makes such a great dish because flavors have had time to meld, creating such richness. And this bowl of chili most definitely looks rich and flavorful! And a plate of cornbread to go with it? Absolutely!! Good eats for Super Bowl Sunday John! Hi Kumar, this is a really fun recipe! Loads of interesting ingredients, and terrific taste! Thanks for the comment. Hi Helene, coriander and cumin are wonderful, aren't they? And important in so many different cuisines. Thanks for the comment. Hi Shannon, this really does have a fairly complex flavor -- loads of things going on in this recipe! Thanks for the comment. Hi Lea Ann, we've cooked many more corned briskets than we have BBQ'd. But that's changing! We can get really great BBQ where we live (heck we can walk to 2 different places, each with a slightly different style, and both very good), but doing one's own is always much more fun. Thanks for the comment. Hi Chris, a brisket yields a lot of meat! And there's only 2 of us, so much as we love leftover BBQ brisket, it's nice to have choices, too. ;-) Thanks for the comment. Hi MJ, this is a wonderful dish -- loaded with fun flavors. And I can never resist cornbread! Thanks for the comment. This is such a great meal to make with leftovers. I love when I can repurpose something I've already made. Hmm, a good observation by Mrs. KR. I know exactly what she means - I think. Enjoy your chili on Super Bowl Sunday! Hahahaha! That sure didn't come out right - Mrs. K.R.!!!! My mind slipped into the gutter for a sec on that one! This combo of BBQ and chili is BRILLIANT! I love throwing in beer when I make chili too - so flavorful, specially with all those spices! Hi Laura, this really is a goodie! We love it! Thanks for the comment. Hi Beth, we actually need to make another batch of this! It's so good we wolfed down our most recent batch. ;-) Thanks for the comment. Hi Shashi, yeah, that didn't come out at all right. ;-) This really is a lovely combo -- such great flavor. Thanks for the comment. I'm not that interested in the game, but I do love the food that goes along with the Super Bowl. This chili looks perfect for a football party! This is a terrific idea for using up your leftover BBQ brisket. It looks quite mouth-watering! Hi Lisa, I'm almost always more interested in the food than the game too (unless a team I'm rooting for is playing; which doesn't happen very often, alas). Thanks for the comment. Hi Uru, this dish really isn't your cup of tea, but your brother would certainly like it! Thanks for the comment. Hi Amy, this really is a good use for brisket. Not that I usually have problems polishing off BBQ brisket, mind you but always nice to have options. ;-) Thanks for the comment. Hi Carolyn, BBQ really works in chili! When I first made this dish, it was an eye opener for me. And yes, it's a super bowl of food! Thanks for the comment. Love this hearty chili. I'm also passing this recipe to my husband who is a meat and BBQ guy. Hi John, what a great idea and recipe for super bowl, love that you can make it ahead of time and not miss any of the game. You are the Mr. Chili (as well as Mr. Cocktail). I love all the chili recipes, John! You even use the leftover brisket to make this chili. Must be so good. I love veggies and feel like I can be vegetarian, but seeing great meat dish like this, I know I'd never become one. Haha. Hi Greg, :D Thanks for the comment. Hi Jersey Girl, I'll bet your husband will love this! Thanks for the comment. Hi Cheri, make-ahead recipes really rock, don't they? ;-) Thanks for the comment. Hi Nami, we actually eat more vegetarian type dishes than we do meat ones! Including an awesome veggie chili. ;-) Can never resist meat, though. Thanks for the comment. What a great recipe for this time of year, sounds perfect! Honestly, your photography is always just superb! I love that pretty sharp green contrast of the chili pepper slice. This sort of recipe is a challenge for me to photograph. Great recipe as well, btw, I'll want to try that for Super Bowl. Hi Julia, we're becoming chili fanatics, I must say. And this might be one of the best we've done! Thanks for the comment. Hi Caroline, isn't this nice? Truly delish stuff. ;-) Thanks for the comment. Hi Smidge, thanks for the kind words! A good garnish makes a lot more interesting photo in a dish like this, I've found. And thanks for taking time to comment. Hi Pam, it is, it is! ;-) Thanks for the comment. I love the idea of adding a BBQ meat into a chili recipe. I'll have to try it out! Hi Pamela, it's a really fun dish! Definitely worth trying. :-) Thanks for the comment. Oh my! look at the colors of this dish. I would LOVE to try this one but with lamb since we do not eat beef. Thanx for sharing. Hi Taruna, lamb makes seriously good BBQ! I'll bet it would be awesome in this dish. ;-) Thanks for the comment. I am seriously getting so hungry looking at this right now! It's constantly snowing here, so I would love some of this to warm me up! Hi Cathleen, this is a perfect winter dish! It'll chase that snow away. ;-) Well, not really, but you know what I mean! Thanks for the comment. Just when we hadn't gotten over that mouthwatering beef brisket dish you had the last time, here you are creating another great dish out of it. "Barbecue in a bowl" sounds awesome!!! Im surprised to see the brisket diced, here in Canada Chili Is usually ground meat. The two surprising ingredients sound fantastic and would really push the ordinary chili into extraordinary territory. Perfect for today too. Hi Julie & Alesah, BBQ in a bowl is wonderful stuff. ;-) Thanks for the comment. Hi Eva, chili in the US is usually ground meat too, although Texas chili is often diced. Different mouthfeel, and quite nice. Thanks for the comment. I've never had chili with diced meat....this looks delicious! I love repurposing left overs, and this is one of the best that I have seen. Coriander, cumin, chili powder, beer....ooooh...you can't go wrong can you. Wonderful post John. A different and delicious chili, I'm sure John. Perfect with cornbread for a great warming winter meal. "Barbecue in a Bowl" that sounds amazing. Love your Chili variations, they are always an inspiration. Hi Minnie, this really is a neat dish, isn't it? And diced meat adds so much texture to chili! It's like a whole new dish. ;-) Thanks for the comment. Hi Karen, we're big cornbread fans around here. Chili, too. :-) Thanks for the comment. Hi Daniela, chili is so versatile -- you can do almost anything with it! Thanks for the comment. It's high time that I hand over your precious recipe to him. Can't wait! Hi Nusrat, always nice to have someone cook for you, isn't it? And hand you your napkin. ;-) Thanks for the comment. Hi Raymund, it's a really great cold weather dish. Very comforting! Thanks for the comment. Simply damn delicious tender and spicy bbq brisket chili!!! Hi Dedy, it's really a good dish -- loaded with flavor! Just what we like. :-) Thanks for the comment. You seriously know your flavours. Super impressed with the flavourings in this dish. We have similar taste. BIG flavours!! There's alot on your site I want to make!! Hi Nagi, big flavor is hard to resist, isn't it? Love them! Thanks for the comment. I never thought in using left over meat to make chili...thank you so much for the inspiration...now this chili sounds and looks fabulous with big chunks of meat....only one word for it....YUM! Hi Juliana, isn't this nice? Really tasty and fun stuff! ;-) Thanks for the comment. Beautiful heart warming dish! Lots of great flavours and textures and with a slice of corn bread sound alike the perfect meal. For some reason my spell check even confuses me more as it automatically changes it when typing... chili, chile, chilies...technology is a love/hate relationship. Hi Bam, spell checks can really confuse one sometimes! ;-) This is a great dish -- your boys would love it! And the batch just about makes enough for them, I think. ;-) Thanks for the comment. I love me some spicy chili!! I love the addition of the beef brisket to chili. What a great idea. Hi Ashley, brisket in chili works really well! As does BBQ sauce. Who would have thought? ;-) Thanks for the comment. This looks amazing, we are going to start experimenting more with american style bbq. This looks to easy. Hi Liz, BBQ is really good stuff -- we can't get enough of it! And leftover brisket is so tasty in this dish. Thank for the comment. The spices in it makes the dish so rich in flavours. I would love the smoked flavour of meat in my chili. Jalapeño adds that kick! John, your chili sounds so good. .. I am saving this recipe. Hi Purabi, this dish does have a lot of flavor, and you can easily add more spices if you like. ;-) Thanks for the comment. Hi Terra, this is such a fun dish! Love the combo of flavors -- so interesting. :-) Thanks for the comment. HI Nagi, you definitely need to try this! Really good stuff. ;-) Thanks for the comment. How did I miss this recipe? I'm just seeing it from you current post for Slow Cooker Chili. This I need to try. Hi VIcki, this is SO worth making next time you have some extra BBQ brisket. :-) Thanks for the comment.